If you’re not already doing some in-person volunteering in your local community, think about getting involved. Savvy business leaders like you have so much to offer organizations that are a good fit for your talents, skills and sensibilities. And guess what? The returns to you can be immeasurable. 1. Volunteering affords some terrific networking opportunities. Serving on the Board of Directors of a local non-profit organization, or in some degree of leadership, may put you elbow to elbow with industry-leading decision makers. Or these people may be connected in some way with your target companies or industries. Volunteering takes advantage of one of the essential and most powerful principles of networking – “give to get”. Your generosity and good work build good will and evangelism for your personal brand. People who see evidence of your efforts – especially if you don’t shy away from the grunt work – will likely spread the word about you. And they’ll probably be happy to help you out when you need them. 2. Volunteering builds your credibility and reinforces you as a subject matter expert in your field. 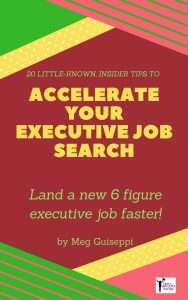 You may already be known as the “go-to” person within your industry for your areas of expertise. Offer up those talents to your community. 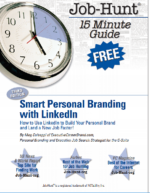 I always advise that my executive job seeking clients work on keeping their personal brand top-of-mind on social media . . . with their network(s) and others who can help them meet their career goals. Volunteering may be one of the best real-life ways to stay top of mind with your personal network. It can also connect you with people you may not otherwise ever meet. People who may provide potent job leads. 3. Volunteering – whether or not you’re paid – counts as “work”. Meaningful volunteering makes for some powerful content to fuel your branded executive job search marketing materials — LinkedIn profile, resume, bio, online profiles, etc. 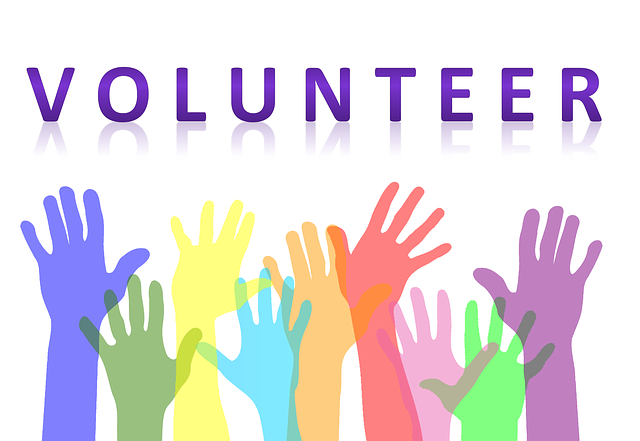 Steady volunteer work, especially if it’s relevant to the paid work you do, helps fill potential employment gaps in your LinkedIn profile and executive resume. If you suddenly become unemployed, it won’t be so obvious to people assessing you. When I’m writing LinkedIn profiles, resumes, bios, etc. for my clients, I love it when they tell me they have a deep commitment to their community. Their contributions are especially valuable and compelling in their career bios, a vibrant storytelling vehicle to evidence their “softer” skills, and further differentiate them from their peers. 4. Never underestimate what YOU get from sharing your expertise as a volunteer. Helping others will make you feel good. 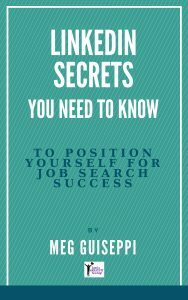 If you’ve been bogged down in job search for any amount of time, it will give you a much needed lift. And how gratifying it will be when you get back something tangible, like a solid lead or two, in return. 5. Your volunteer efforts may open you to new career directions that you had never considered before. 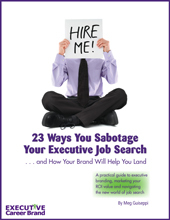 Are you at an impasse in your executive job search because you’re dissatisfied with what you’ve been doing? Or have jobs within your industry have dried up? It may be time to reinvent yourself and re-think your approach to earning a living. Working and chatting with other volunteers can lead you to a better understanding of what meaningful work for you will be. How Do You Find Good Places To Volunteer Meaningfully? Think about the causes that you’re passionate about, and look for local organizations that make a difference in these areas. Ask civic-minded people you know what organizations they support. Schools and hospitals offer many ways to volunteer. A non-profit Board of Directors may be right up your alley. Fill a need within your community by starting a new grass roots organization. 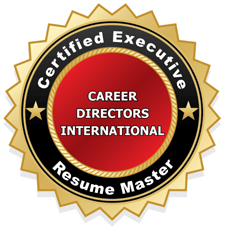 Get behind an organization that will benefit from your various areas of expertise and leadership skills. Keep your eye on doing your part to make it successful. You may soon experience personal and professional dividends. You never know what opportunities may emerge from right in your own backyard.